Something almost happens then nothing. It's the dawning of a new age for mankind when the Catteni descend to Earth and easily overcome the Earth's population. Thousands are herded onto slave ships headed for the intergalactic auction block. Kris Bjornsen is captured in Denver on her way to her college classes and wakes up on the primitive planet Barevi. "The Golden Brat", Reinhard von Lohengramm, a military prodigy and admiral of the Galactic Empire, has ambitions beyond protecting the borders or even defeating the empire's enemies. He seeks to overthrow the old order and become a truly absolute - yet benevolent - dictator. His rival, the humble Yang Wen-li of the Free Planets Alliance, wishes to preserve democracy even if he must sacrifice his political ideals to defeat the empire. February 1, 2344 - The Galileo's shuttle returns to Earth carrying three surviving expedition members, who still appear to be the same age they were when they departed. They report that they have, indeed, made contact with an extraterrestrial race - and become enmeshed in a conflict that brought them face to face with the most apocalyptic force in the galaxy. It is up to Director General John Shillinglaw to piece together the puzzle created by these events - for the survivors tell their stories from their own conflicting perspectives. And the truth is more difficult to glean than it appears. BONUS AUDIO: Includes an exclusive introduction written and recorded by author Allen Steele. ©2008 Allen Steele (P)2009 Audible, Inc. I have been listening to audible books for more than 20 years - since you had to get them on cassette tapes (and they were called books-on-tape). In that 20 years, I've listened to over 400 books and have enjoyed nearly all of them. I really like Allen Steele's books. 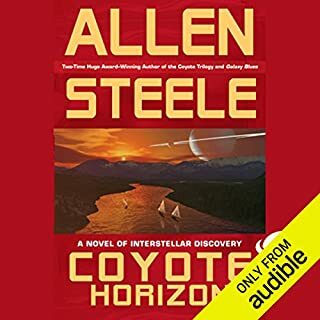 I enjoyed the Coyote series very much. To be sure, there are readers I have really liked and readers I did not like so much. But Andy Caploe is the worst I listened to in those 20 years. Though I like Spindrift so far (I'm about half through it), I'm not sure I can finish it because of the terrible reading. Many times, I'm not sure Mr. Caploe is listening to what he's reading or is even aware that the individual words are part of a sentence. The emphasis is frequently overly dramatic and even more frequently misplaced. The voices are also terrible. His English and Russian accents are laughable. Why he would chose to cast Ramirez - a highly educated, if somewhat flawed character - as a Southern California surfer boy is entirely beyond me. I have never stopped listening to a book because of the reader. Yet. I may be just interested enough in learning how the story turns out to push through, but I'm not sure I'll make it. I will be sure to never again get a book where Mr. Caploe is the reader. I have never before agreed when others have whined about bad readers. Usually I manage to get used to the reader after a while. This time it was a lot harder than usual though. The narrator's rhythm is "unusual" and the voice acting leaves something to be desired. I did eventually get used to it and listen through the entire story. It is not bad. I liked it. I suspect I would have liked it even better if I was familiar with the Coyote Universe. Ideally I would have liked more exploration (of the unknown) and less preparation. The ending was not the best either, but all in all I enjoyed it. 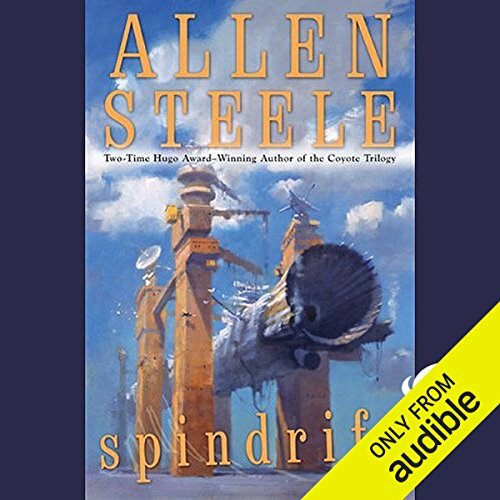 I've loved Steele's other Coyote universe books, but I couldn't finish Spindrift. The voice talent was just awful. 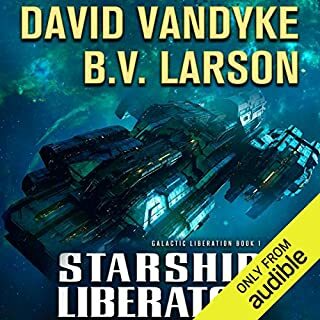 The narrator and main characters were unimpressive at best, and some of the supporting voices - the main scientist in particular - were so whiny, overwrought, and just plain annoying that it was unlistenable. 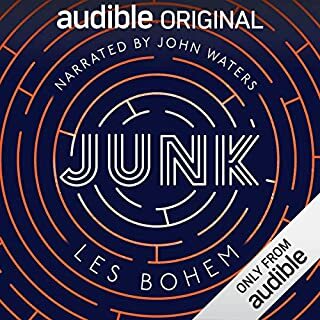 I hate to downvote what is probably a good book based solely on the reading, but do NOT purchase this audiobook. 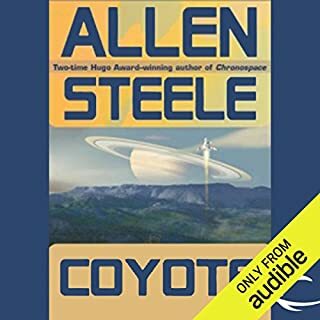 Get Steele's Coyote books in audio, but get this one in print instead. What would have made Spindrift better? 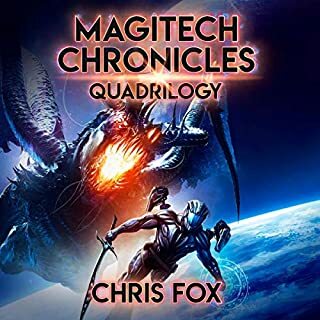 I like the premise but the execution of the whole audio book was a huge letdown. I think the narrator was the biggest draw back for me. His voices were not far from his own and after 6 hours his voice became very grating. I disagree with some of the other comments about the narrator. 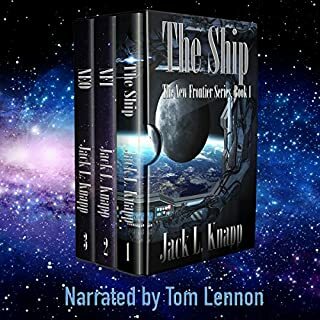 I liked his reading quite a bit, and thought it went very well with this kind of "hard science fiction." He only fell down on the voice of one character which is done as a bad Tommy Chong / 70's stoner impression--that just didn't work. (I think it's usually better when a narrator doesn't push "voices" and accents too hard). The book itself is a nicely paced space exploration story, very traditional and well worked out. Nothing innovative, but satisfying, until the final chapter or two when the story just kind of fades away. It might be because important revelations are being saved for other "Coyote" novels. The over the top voices ruined this book. The stoner scientist voice was so annoying it was a fight to continue to listen. Save your credit. Get Chindi instead if you want the same story but written 10x better. I stayed with this book because in the midst of all the unfunny jokes and the stupid characters, there was an actual good story. The telling of the story was just too tedious at times. If a character leaves a room and goes to meet someone in another room, you may get (he grabbed the door knob and turned it counter-clockwise, pulling the door inward he stepped into the narrow hall, walking at a brisk pace he noticed a smug on the wall ....) Boring detail that does not add to the story. Then the lead character is a scientist who is a mass murderer, who the author thinks we should like. He smokes pot so the narrator gives this genius scientist a surfer dude voice. This guy killed 30,000 people and tried to kill more and we are suppose to feel sorry for him because others won't include him in there circles. In the end the scientist does nine years for killing 30,000 people. Am I the only one that sees something wrong with this? it's amazing how this series came out in 2002. 17 years later, the relevance and importance still rings true. First off the narrator had this odd, awkward speech pattern that made listening to the story difficult and frustrating. He did surprisingly better at speaking in character. The writing was tedious and sophomoric. As a previous reviewer said, the women characters had little depth, they seemed to just be descriptive "arm candy" for the male protagonists. I had liked this author's coyote books, so this was a disappointment. I found this a most enjoyable story of first contact. It is well read and easy to follow. Some die hard readers of Science Fiction may be familiar with this type of plot and find little new, but I simply enjoyed it. I supposed it helped a little that I read/listened to the Coyote novels, but that is not necessary to enjoy this book. This is much more "alien" than the Coyote books.